In this section we describe four genetic disorders that have been identified in young children: Cystic fibrosis, Muscular Dystrophy, Klinefelter Syndrome, and Turner Syndrome. These syndromes affect not only the health and well-being of children, but also impact on their development. Some parents wonder about prenatal testing for these and other disorders (for example, Cornelia De Lange, Cri-Du-Chat and many other syndromes). Prenatal testing for genetic or neural tube defects are available for women in BC. Cystic Fibrosis1 is the most common fatal genetic disease affecting young Canadians. CF is a multi-organ disease that primarily affects the lungs and digestive system. It is estimated that one in every 3,600 children born in Canada has CF. At the present time, approximately 3,500 children, adolescents, and adults with cystic fibrosis attend specialized cystic fibrosis clinics in North America. Cystic fibrosis does not affect the child’s development. However, the specific treatment and care requires extensive time that takes away from children’s regular play and school activities for preschool and school-age children. This is why children with cystic fibrosis may qualify for additional support once they enter Kindergarten. Early intervention in the form of monitoring, provides support for the child and family following up with developmental information, ages and stages, opportunities for play and interaction. Muscular Dystrophy2 is the name for a group of neuromuscular (see full Glossary) disorders involving progressive weakness and wasting of the voluntary muscles that control body movement. 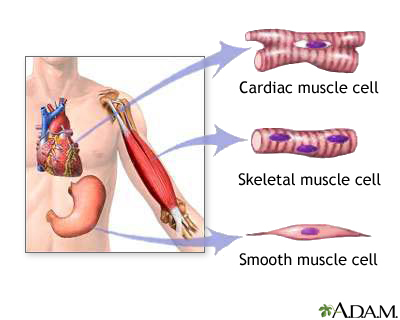 As muscle tissue (see full Glossary) (Fig. 1) weakens and wastes away, it is replaced by fatty and connective tissue. Forms of muscular dystrophy include Duchenne (the most common, with onset around 3 years old and more prevalent in boys), Facioscapulohumeral and Myotonic. Spinal muscular atrophy is the one usually identified in early infancy. Babies limbs are floppy and trunk is very weak. Children with this syndrome find it harder and harder to walk, and to do any movements. Klinefelter syndrome3 is a term used to describe males who have an extra X chromosome in most of their cells. This syndrome mostly affects the boys’ physical, language and social development. Turner Syndrome (TS)4 is a condition that affects only females. It is caused when all or part of the second X chromosome in some or all of the cells of the body is missing. Physical characteristics may include small stature, puffy hands and feet, extra skin folds at the side and back of the neck, heart abnormalities, recurrent ear infections or hearing problems. Each genetic condition or syndrome has its own unique characteristics, behaviors and challenges. Intervention options need to address how the disability or disease manifests itself for the child. A family who has a child with a genetic condition faces many challenges. The family may require genetic counseling (see full Glossary) to further explore the implications for the genetic condition. The family may also require family support or counseling to deal with the possible strong emotional reactions to the diagnosis. Families may also have concerns and be impacted by the high costs of medications, therapies, multiple treatments, etc. This is why families will require a team of interventionists involved in their lives and the life of the child.